Beechen Lane is 1 kilometre (2/3 mile) to the south of Lyndhurst High Street, off the A337 road leading towards Brockenhurst, and opposite the turn for Foxlease (the Girlguiding UK Training and Activity Centre). After passing beside the relatively modern houses of Hillary Close, the tarmac road becomes a gravel track leading through New Forest woodlands towards what, many years ago, was Lyndhurst Old Park, and on to Denny Lodge. Marked as Beechen Lane way back on Isaac Taylor’s 1759 map of the New Forest, it was then probably used as the main route through to Denny Lodge. Indeed, some have suggested medieval origins and use by the Cistercian monks of Beaulieu. But now, as a pleasant walk and cycle-track, the lane runs beside Pondhead, Park Ground and Parkhill Inclosures, and on beside ancient, unenclosed woodland before petering out 1.5 kilometres (1 mile), or so, from Denny Lodge. Park Ground Inclosure lies to the south-west of Beechen Lane. Planted in 1810, it contains much oak and beech together with a number of small conifer blocks. Intriguing, moss-clad undulations in the southern corner of the wood – the part adjoining the A337, close to the Forestry Commission car park - betray the site of late-17th century clay excavation stimulated by a need for bricks for use in rebuilding Queen’s House, Lyndhurst. Indeed, here can also be seen evidence of an old brick kiln. Almost certainly of a type known as a ‘clamp kiln’, it has left a circular depression containing feint traces of brick remnants. Appropriately, the area is called Clayhill Heath. Pondhead Inclosure, the woodland to the north-east of Beechen Lane, was planted at around the same time as Park Ground, and contains mainly oak, beech and sweet chestnut. It is called Mine House Grounds on the late-18th century Richardson, King and Driver map, which is possibly a reference to 17th century attempts at open-cast coal mining in the New Forest. The woodland here is of particular interest to the naturalist, as for a considerable number of years, commoners’ stock have been totally excluded, and intermittently, deer also. 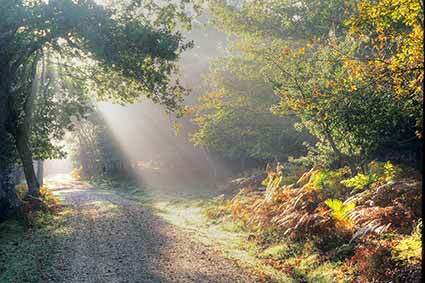 Free from grazing pressure, wild flowers flourish, and so, too, does a luxurious woodland under-storey, both unusual features elsewhere in the New Forest. Relatively recent rotational hazel coppicing and the creation of woodland clearings contribute to Pondhead’s unique character, whilst two mature conifer blocks have been felled with the intention of eventually planting oak. In the process, though, bramble-clad rides - butterfly habitat supreme - have been severely damaged, and roe deer culled to allow hazel coppice and oak re-growth. But in the long run, wildlife should benefit from the work. Nightjars, for example, were almost immediately attracted to the newly created open spaces, and redstarts quickly took up residence amongst the hazel coppices. Brambles will again re-establish themselves, other wild flowers will flourish, and rare, pearl-bordered fritillary butterflies may return after an absence probably brought about by over-shading. But how long this all takes, remains to be seen. Pondhead Conservation Trust was formed in 2014 to restore the hazel coppice in Pondhead Inclosure and has been recognised locally and now nationally. The trust, set up as a community woodland project, has been awarded the UK National Parks 'Volunteer Project of the Year', competing against other projects nominated from any of the fifteen national parks across the UK. The Trust's volunteers have worked hard in restoring the largest remaining area of hazel coppice on the Crown lands of the New Forest. Restoration benefits the coppice wildlife along with increasing the amenity value for locals and visitors alike. The group has also revived one of the New Forest's oldest industries, which died out in the last century, by using the timber cut during restoration activities to produce BBQ charcoal. The charcoal burners of old lived in the woods with their primitive production methods. Those methods have long gone and today Pondhead charcoal is produced in a modern environmentally friendly kiln and sold through a network of farm shops and other outlets entirely within the New Forest. In this way, the group manages the woodland in a fully sustainable way.